Every once in awhile, when I’m trying to clean up after a holiday binge fest (ahem, Thanksgiving), I look no further than raw vegetables. 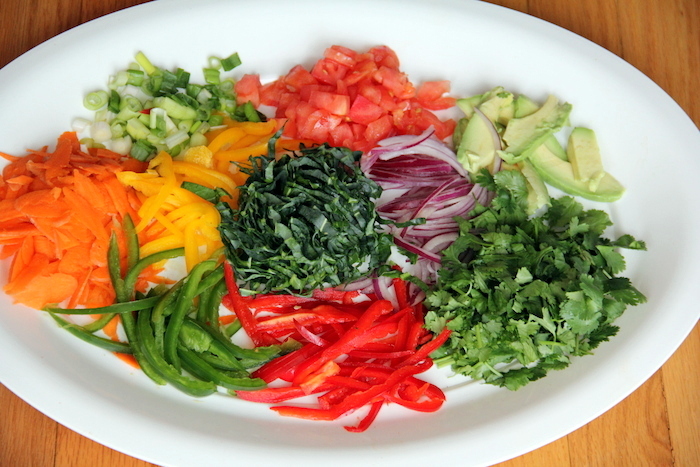 I try to keep it simple, colorful and, of course, uncooked. By not cooking the veggies, I retain their nutritional integrity and am able to enjoy a texture-filled meal full of roughage. 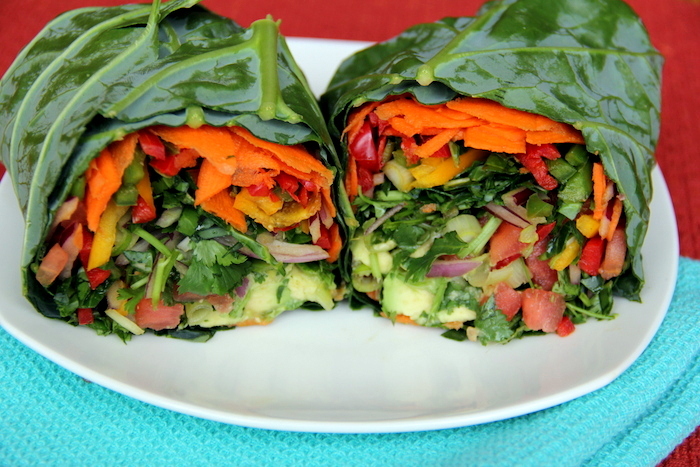 The following burrito recipe is packed with plenty of veggies, herbs and creamy avocado. No oils needed! Enjoy! Assemble the ingredients. Spread the veggies and herbs evenly across each collard green leaf, season with salt and pepper, spritz with lemon juice and roll. 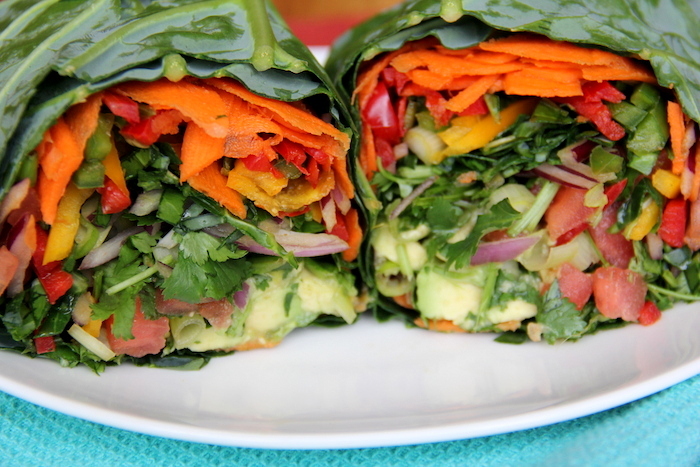 For even more color and zest, pair this burrito recipe with the pink cauliflower dip (not raw). 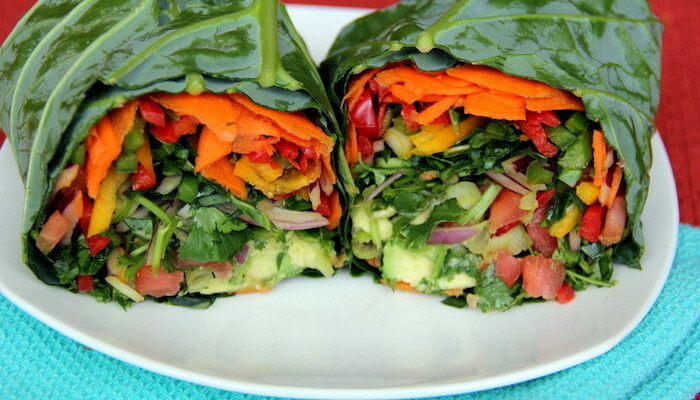 This entry was tagged burrito recipe, burrito recipes, detox recipes, easy healthy recipes, going vegan, good vegetarian recipes, great vegetarian recipes, healthy, healthy breakfast recipes, healthy dinner recipes, healthy food recipes, healthy recipes, heart healthy recipes, how to become a vegetarian, quick vegetarian recipes, raw, raw food, raw food detox diet, raw food diet, raw food diet recipes, raw food diet weight loss, raw food recipes, raw food world, raw foods, raw foods diet, simple vegetarian recipes, vegan, vegan essentials, vegetarian, veggie recipes, what is a vegan, what is vegan. Bookmark the permalink.